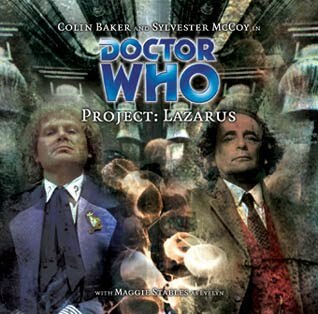 It’s inevitable that in this fortieth anniversary year Big Finish would commission a multi-Doctor story, and while the upcoming ‘Zagreus’ promises to make use of all four of the current audio Doctors, ‘Project: Lazarus’ offers a more surprising combination of the Sixth and Seventh Doctors. Impressively, after starting as a direct continuation and sequel to ‘Project: Destiny,’ by its end it becomes wholly its own entity that makes impressive use of its two leads. When the Doctor finds a cure to the twilight virus, the Doctor and Evelyn materialise in Scandinavia but find that they are too late to help Cassie. The Cassie they find is an embittered, hardened woman who has had to endure two tough years of scavenging and evading Nimrod. It becomes increasingly clear that Cassie has lost that battle, though, as the Forge appears and Nimrod greets her as his colleague Artemis. Cassie’s story doesn’t continue to the end of the tale, though, as Nimrod kills her once she realises that she has no memory of her son and that Nimrod has been controlling her in a more sinister fashion than she believed. After setting the scene with the Huldran legend of Scandinavia and corpses found covered in a blue slime in the forest, the reintroduction of the Forge and Nimrod works exceedingly well, easily showing how dangerous the organization can be. Wanting to add a Time Lord to his alien collection, Nimrod tortures the Sixth Doctor almost to the brink of regeneration, a scene that would become increasingly important in the latter half of the story. Conveying true agony and pain is difficult in any situation, but Colin Baker does an admirable job, reinforcing Nimrod’s threat going forward. This portion of the tale truly shines as it takes Evelyn on a very dark path. After reaffirming the genuinely friendly relationship that the Sixth Doctor and Evelyn have during breakfast in the TARDIS, Evelyn and the listeners are taken on a very emotional journey as she has to cope with Cassie’s death and then reveals that she has been suffering from a terminal heart condition for quite some time, the true motivation behind her travels with the Doctor. This lends an air of vulnerability to Evelyn, but it also puts her desire to live life to the fullest and to help others in a completely new light. Likewise, as the Doctor is forced to endure another loss, Colin Baker puts in a superb performance as he is palpably shaken and upset about failing Evelyn and her resulting grief. The dark foreshadowing the Seventh Doctor instills as he tells his former incarnation that Evelyn never forgave him up until the end is tragic. The third episode completely switches the tone of proceedings as events shift to the perspective of the Seventh Doctor, travelling alone in the TARDIS and muttering to himself that he is not nearly as forgiving as his former incarnation as he sets his sights again on the Forge. The sheer anger and contempt McCoy is able to exude is utterly convincing and terrifying, setting the scene for a return visit to Nimrod’s lair. This splitting of the story is certainly a unique take on the multi-Doctor premise, but it works exceedingly well and even more when the Seventh Doctor comes upon a cloned version of the Sixth working for Nimrod. While the story makes it quite clear that this Sixth Doctor is not the genuine article as he struggles to keep up with technical jargon, asks Nimrod if he can kill the Doctor, and even loses an arm- not to mention the Seventh Doctor not remembering ever working for the Forge- the revelation is played out nicely over time and Colin Baker is great in portraying a less confident, more shaken, and more subservient version of this Doctor who ultimately becomes a sympathetic hero as he realises his entire existence is a lie and just another in a line of experiments. It hardly needs mentioning, but the character of Nimrod is essential to proceedings, and Stephen Chance perfectly recaptures the terse and terrifying undertones he brought to the sinister role in ‘Project: Twilight.’ He is allowed more freedom to express his villainous side in this story, though, and he portrays that subtle change in character perfectly, seeming a somewhat trustworthy character due to his saving Evelyn in their previous encounter but slowly revealing his true intentions with callous and open threats of violence and death. Although the ending is telegraphed quite early in the story, ‘Project: Lazarus’ proves to be yet another highlight of Big Finish’s main range. By adding new layers to both the lead characters- especially Evelyn- and returning characters, this is an emotional tale that the strong performances and matching production values elevate into something special. It’s a unique and successful spin on the multi-Doctor format, and it also seems to assure another appearance from Nimrod in the future as the Forge’s beta facility begins operation.